Global consumption of chromium chemicals, which had been slowly eroding for the past 20 years primarily as a result of environmental concerns, has begun to rebound. 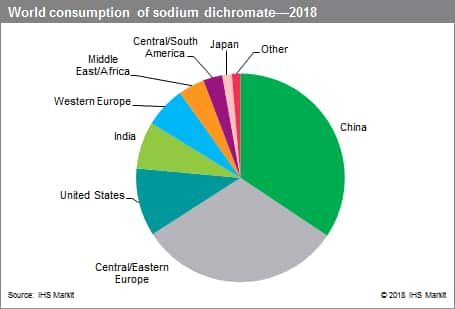 Future growth in consumption of sodium dichromate and its derivatives is expected to be modest and fluctuate with GDP, driven largely by growth in China and Europe. New market entrants are unlikely and would encounter highly competitive process technology, high capital costs, substantial environmental risks, increasing economies of scale, earnings cyclicality, and advanced market maturity. China is the fastest-growing region, but even the Chinese government is attempting to reduce the number of small plants, replacing them with larger, more modern facilities, with improved environmental protection. Untapped chromite ore deposits are plentiful, but are geographically concentrated in South Africa and Kazakhstan. Six companies account for the majority of chromite ore production, and they are vertically integrated into metallurgical applications. Chromium chemical production begins with chromite ore production. Four countries dominate chromite ore production: South Africa, Kazakhstan, India, and Turkey. Combined, they accounted for the majority of total world production of chromite ore. Production declined between 2011 and 2014 because of a general economic slowdown, especially in Asia, but has continued to grow quite steadily between 2015 and 2018. Most of the chromium ore consumed worldwide is used in steel production. Of the chromite ore produced, 92% is used by the metallurgical industry, and of that 95% is used to make stainless steel. Chemical production and refractories and foundries each account for 4%. An estimated 1.2 million metric tons of chromite ore was consumed in chromium chemical production in 2018. Production of chromium chemicals typically accounts for about 5% of the total quantity of chromite ore consumed. The past three years have seen the closure of smaller, less-competitive producers in mature markets, as well as several Asian facilities that were closed for environmental and economic reasons, with China being a net importer of chromium chemicals. Sodium dichromate (Na2Cr2O7·2H2O) is the starting material, either directly or indirectly through intermediate steps, for all chromium compounds. Consequently, it is the most important of all industrial chromium chemicals. Sodium chromate (Na2CrO4) also has industrial applications, although on a much smaller scale. Most sodium chromate produced is converted directly to sodium dichromate. Chromic acid (CrO3) is the second-most-important industrial chromium chemical and is used in the preparation of wood preservatives and in metal finishing operations. The other significant chromium chemicals include basic chromium sulfate (leather tanning), chromium oxide (metallurgical, refractory, and pigment applications), chromium pigments, and other chromates and dichromates. Use of potassium dichromate and ammonium dichromate has nearly disappeared. Global pricing of chromium chemicals in the past eight years varies considerably from region to region, by industry, and depending on producer strategy. With consolidation of chromite ore production to a few companies, prices have increased dramatically.